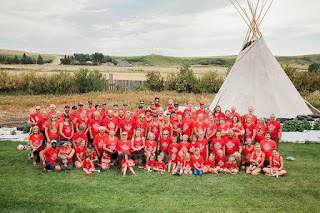 My dad's family had a big reunion this past July. 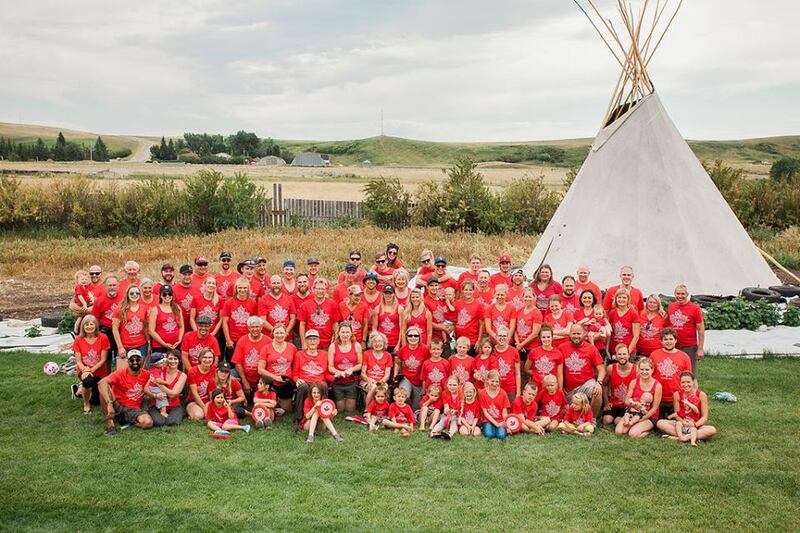 Eighty eight of the one hundred thirty two people descended from my grandparents met at my aunt and uncles ranch in southern Alberta for the first time in 20 years. It made the local papers because, giant family and all. I was not sad. I was prepared for it. They sent us family reunion T shirts, and we sent them a photo of ourselves wearing them to put up for all attending to see the missing parts of the family. It was kind and thoughtful. We have a facebook group for all of the photos from large family events, so I saw the photos. I saw pictures of everyone having a good time rafting on the river, cooking together, camping together. I was fine. Then I started clicking through about 50 photos of the location, posted by my aunt. I immediately commented, "Where is all the trash? [She says in amazement, after 4 years of working in a culture that believes the entire outdoors is to be used as a trash can.]." Trash is something I just can't get through to people about around here. The idea that one could walk somewhere, anywhere, and not see piles of trash just thrown on the ground is completely alien. When I ask my house helper to sweep our outside sidewalk, unless I'm specific about using the dustpan, she just sweeps all the small pieces of trash into the grass, like that's where they belong. The trees are lovely. But notice the ground. Every time it rains the water uncovers yet another layer of refuse in our yard, broken glass, bottle caps, plastic bags, all just left there by previous tenants, who expect the jungle to absorb it, like it does everything biodegradable, and leave no trace. So I brought my laptop out into our main office area, I was at the office that day, and showed the photos to one of our staff members from Myanmar. "What don't you see?" I asked her. "There are eighty-eight people staying in this one place, for several days. What do you notice about the ground?" It took her a while to figure out what I was talking about. "No garbage?" "Eighty-eight people and not one single little piece of trash on the ground. I am so homesick." And then I wasn't fine anymore. I had to leave the room and sat at my desk crying for a while, my heart desperate to rest somewhere clean and unspoiled. Sadness for the people and places I miss sneaking in sideways through some simple photos of tents on grass. Thailand is beautiful. One of the most beautiful places I've ever been. Limestone mountains, stunning skies, the bright green of rice paddies surrounded by the dark green of jungle, waterfalls, beaches. As long as you don't look down, it's a gorgeous place. Usually I love it here. Once you look down you'll see the trash. You'll see the evidence of people carelessly discarding things everywhere you step. No one picks it up, it just lies there until it's slowly covered by the undergrowth, layer, by layer, by layer. This village has a giant trash heap in front of the gate. I'm usually pretty good at looking up. I keep my eyes focused on the beauty. It's part of my practice of gratitude. I pick up trash and pick up trash and take comfort in that one small area being clean again. I don't think about how someone is going to come along behind me and dirty it back up almost immediately. The next picnicker, the next child with a cellophane wrapped snack. Since July it's been really hard for me to look up. All I see is the trash, the dirt, the ants, the cockroaches, the hard things. I see the people who could be working together to help people fighting with each other instead. I see the horrors, the abuses, the people kept down by other people. Trash has become the metaphor for everything else, the evil that mars the beauty of this place, of this world. 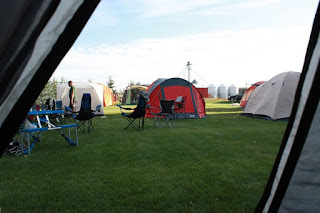 Friends and family in Canada, and the US, went hiking, and camping, in pristine wilderness areas. That's what you do for the few short months that it's summer there. You get outside and you do things. You enjoy the beauty all around you. My eyes go over the photos, noting the ground, resting on the places where there is nothing that shouldn't be there. Only grass, and earth and water. Not a single floating juice box to be seen. My 2 littlest boys got pneumonia. Maybe the constant damp mold of rainy season helped that along. We went to the hospital, where it's always a struggle through different languages to understand the diagnosis, and the treatment. My oldest son got a skin infection. We get them so often here. I have to take antibiotics, again, for a parasite that can live up to 24 hours in water, that I picked up who knows where. The water we use to shower, and wash dishes, and everything else except drink is not clean water. It comes from a pond reservoir somewhere. When it rains it fills with rotting plant matter. There is no processing of it before it enters our house, besides letting it sit in a holding tank so the sediment has time to drift to the bottom. We shower with our mouths clamped firmly closed. Of course we get parasites and rashes. Our tap water comes from this kind of reservoir. The boys, who were improving after their first treatment have a relapse. We go to the public hospital, which means waiting all day in lines to see the doctors, 2 days in a row. They are given a much more aggressive series of treatments and this time are actually getting better. My husband leaves for a month in the US. He doesn't want to go. He is home here. He gets reverse culture shock on entering America again. I am almost physically jealous of him because he gets to shower in what we call drinking water for a whole month, and not worry if the water he bathes in will make him sick or give him a rash. When I tell him this, he hasn't even noticed. He still showers with his mouth clamped shut. I so desperately want to be in a first world country again for a while. Just to bathe in clean water feels like an absolute luxury right now. I miss washing vegetables I plan to eat raw in water from the tap. I'm fixating on small things, like clean water. I may be avoiding thinking of bigger things by doing this. My daughter sneaks into my bedroom late at night to cry. The uncles she spent most of her childhood with have gone and grown up without her. They have beards. One has gotten engaged. It's been more than 4 years since she's seen them. She grieves because they're strangers to her now. I don't know when she will get to go back and see them again. I can only hug her and let her cry. My son comes home. A visit to a friend turned into attending a memorial service for a little boy who died. I wish I could say that's the first funeral he's attended for a child. But it's not. He says he's ok. Four hours later he's not ok anymore. He's crying and angry that people have to die like that. He's seen a lot of death for his age. I hug him, and let him cry. I haven't cried in a while. I'm just tired, all the time. Weary. The news is full of tragedy. Local and far away. Humanitarian crisis in Myanmar. Mass shootings and hurricanes in the US. I feel like life here requires so much more vigilance than life in North America did. There is so much to guard against, to be aware of, to monitor. Health is always a challenge. So is driving. I'm always on edge, even when I'm not aware of it. Maybe we all are. My walks through the rice fields, usually a source of refreshment, make me sad right now. I see all the trash on the ground. There's more every week. I see the filthy kids playing in the trash filled ditches. I see the farm workers spraying poison in the fields, that will make them and their families sick. I know this is only part of the picture. I know that there is beauty side by side with the ugly. I just have to look around and see it. In this current season, it's harder than it used to be. But I'm still trying. Prayers for you - such a tangible example of so much of the both/and of this life. We have to keep looking up to be able to bear it when we look down. Just reading about what life is like, holding your mouth closed tight while you shower, it pressed in on me in a way I cannot really describe. Thank you for sharing the reality - the beauty and the hard. May your guardian angels remain close and keep you safe.